I painted a teapot! 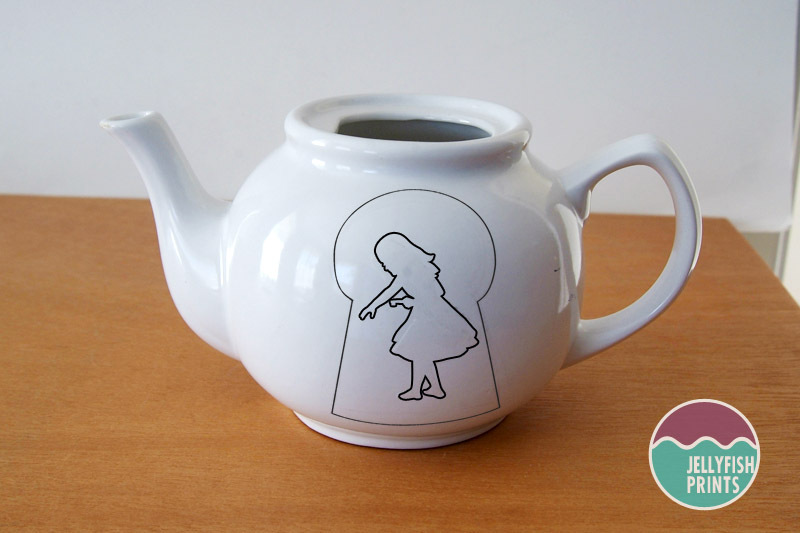 An Alice in Wonderland Teapot. 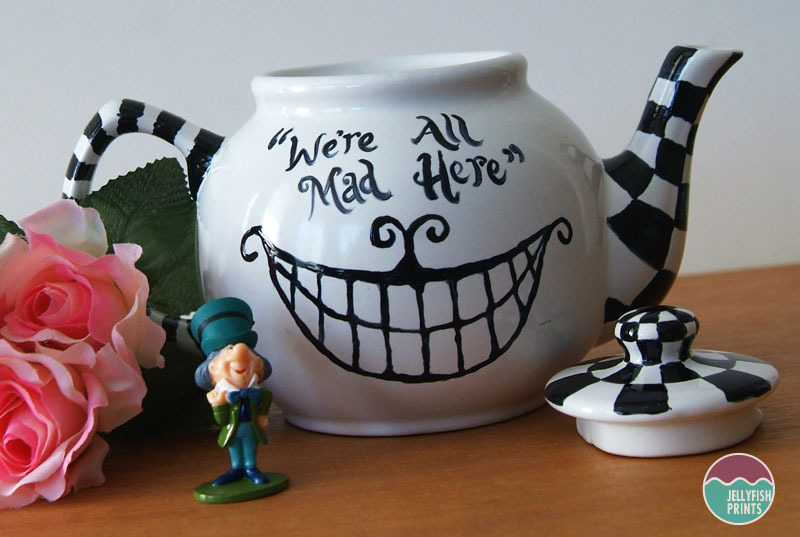 Yep, I am totally hooked on painting stuff so I transformed an unexciting plain white ceramic teapot into this Alice in Wonderland birthday party themed creation. Can I just say how in love with it I am right now. I don’t ever want to part with it. It can be used to serve tea at your Alice in wonderland tea party or if you pop some flowers into it like a vase it would make a wicked cool table centerpiece. 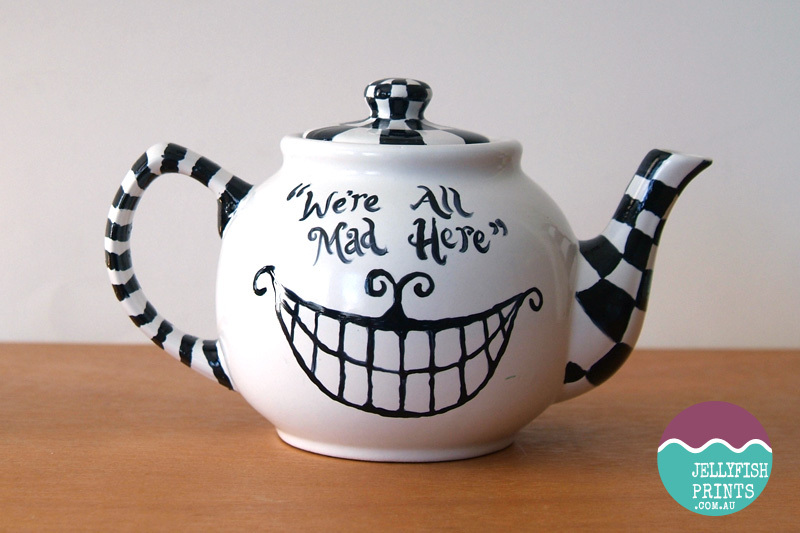 If you want to make your own DIY Alice in Wonderland teapot a then read on…. First give your teapot a good clean. I picked up this teapot on my op shopping travels for $3 at a Vinnies so it was used and a bit tea stained on the inside – sign of a well used and well loved teapot, lots of good vibes. I cleaned the inside using a neat trick I found on Pinterest. I poured a bit of dishwashing powder into and and filled it up with boiling water. Put the lid back on and wait for 30 minutes. All the dirt had come away from the ceramic and it looked as good as new. Now give the outside of the teapot a good clean and rinse it off well. We want the paint to stick to the teapot so do a good job. When the teapot is dry, wipe it down with rubbing alcohol and a paper towel to remove any lingering fingerprints and oils from our skin. I searched online and found an image of the smiling Cheshire cat along with one of the quotes I wanted to use. I lightly hand sketched this design on to one side of the teapot then painted it on with the black ceramic paint and a skinny little brush. I thought my 0 sized brush might be a bit too small but the paint is quite thick so the small brush size was perfect for me. It took me a while to get the hang of painting on the ceramic surface with the Porcelaine 150 paint and I can probably still improve my technique but i got it on there. A cotton bud tip and a bit of rubbing alcohol (or window cleaner if you don’t have alcohol wipes) is all you need to clean up any mistakes you make. This image i wanted to match the quote “Curiouser and Curiouser” hence Alice within a keyhole. I took a picture of Alice pulling back the curtain with the key in her hand and tidied it up a little so that I could print it onto contact paper to make a template. You can download and print this modified Alice template here. Cut a piece of clear contact paper to fit in to your printer – A4 size is good. Print off the image onto plain paper first to get an idea of how big the image is and whether or not it will fit on to your teapot. Increase or decrease the size in your print settings if required. 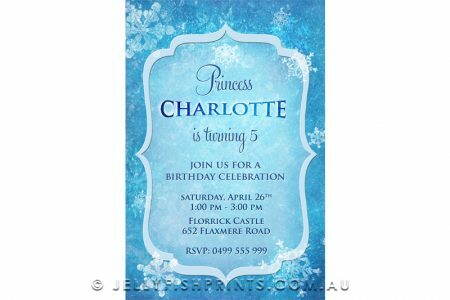 Print the image onto clear contact paper. Place the contact paper with the printed image face down onto the cutting board. We want to cut onto the smooth contact paper side (not the paper backing) Carefully cut out the image with a craft knife. Clean up your teapot with rubbing alcohol. Peel off the contact paper and position it on to the teapot. 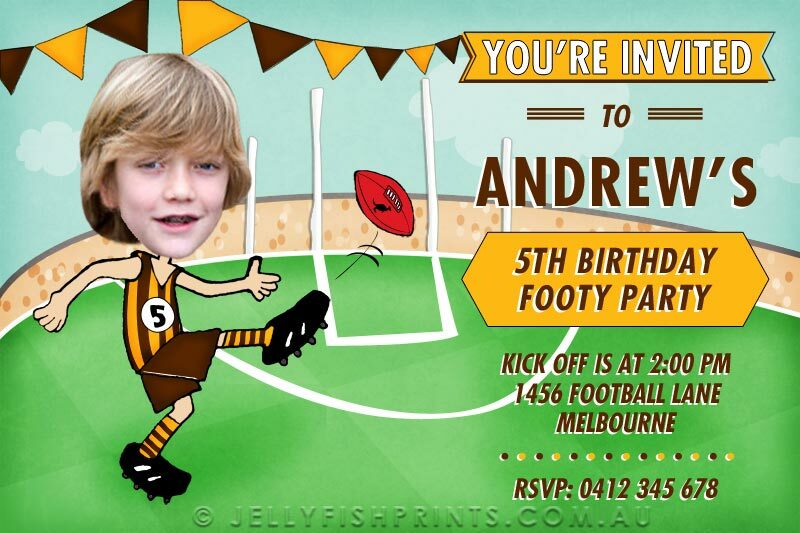 Make sure there is enough space around the image to draw a keyhole around it. Rub it down to help the adhesive stick more. Try and avoid touching the teapot. If you do touch it or you had to repostion the template, just be sure to give it another clear with the rubbing alcohol. Lightly sketch a keyhole around the Alice template with pencil. Fill in the keyhole with the black paint. Leave it to dry a little bit before pulling of the template. Use a toothpick to carefully lift the template off the teapot. 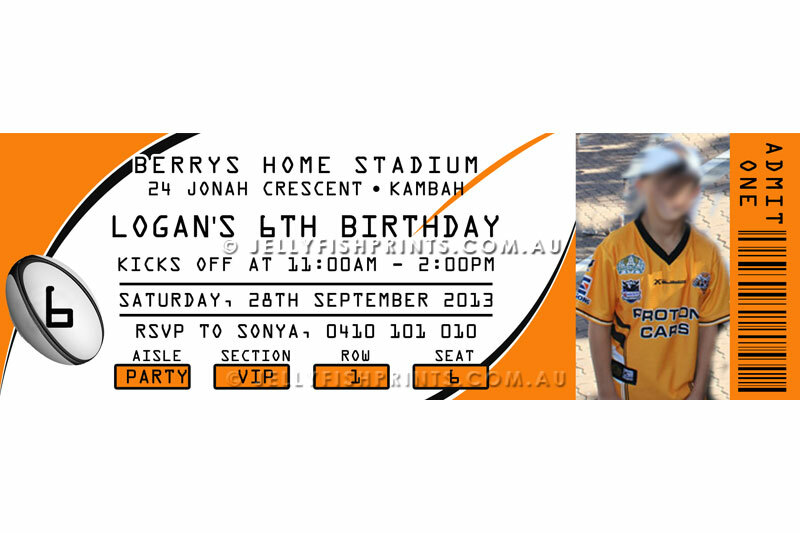 Remember you can use the rubbing alcohol and a cotton bud cue tip to clean up your image. Now I was going to write Curiouser & Curiouser around the keyhole but I decided it looked great without it so I left it out. Paint some stripes on to the handle and checkered squares on to the spout and the lid. Believe it or not but I found the stripes the most difficult to paint on. They were fiddly to paint but again it all worked out in the end. Just make sure the other images are completely dry before you start. Teapot was done but I couldn’t stop there. I had also found a plain white Maxwell and Williams creamer and sugar bowl to partner up with this teapot. 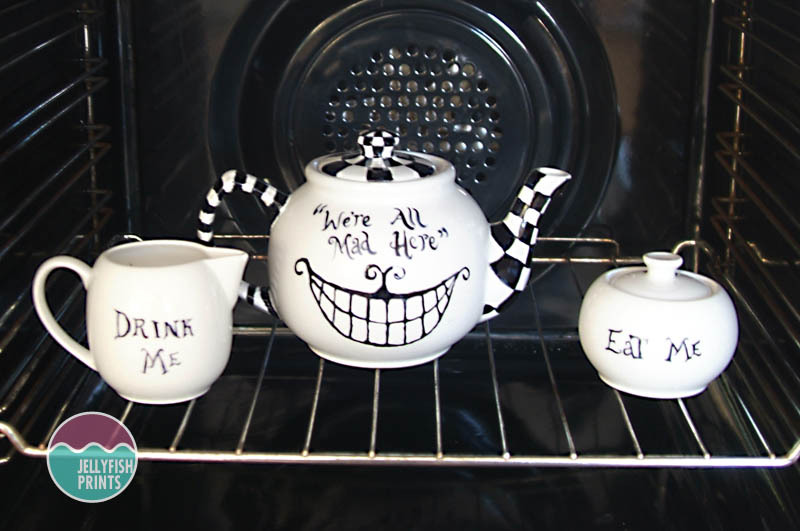 I hand painted the words “Eat Me” on to the sugar bowl and “Drink Me” on to the creamer. They look so cute together. Am pleased. 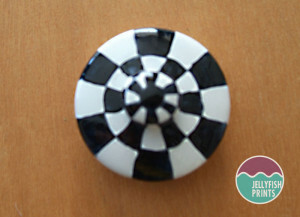 Some checkered squares would look awesome painted on to these pieces. After the finished teapot, jug and bowl has been left to dry for 24 hours. Pop them all into a cold oven. Turn your oven on to 150 C and bake for 35 minutes. This step makes the design painted on permanent. It also makes it microwave and dishwasher safe but I would recommend hand washing your teapot. And there you have it. An Alice in wonderland teapot, creamer and sugar bowl. Now go and enjoy yourself a lovely cup of tea. Super cute! 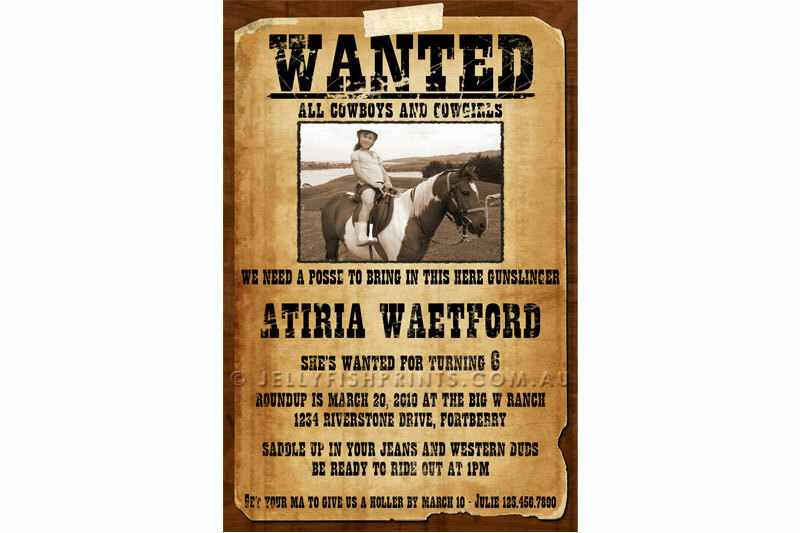 I can’t wait to do this for my daughter’s bridal shower! Thank you!